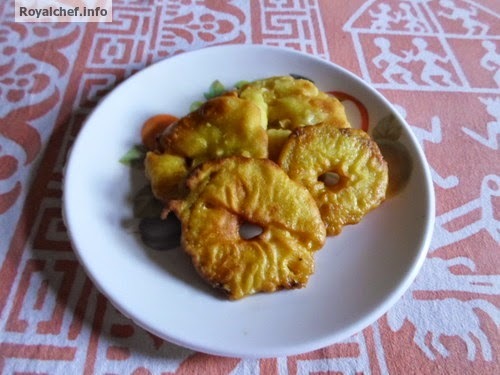 This is a Recipe for preparing at home delicious Sweet Pineapple Rings or Ananas Rings, a easy, simple and tasty pineapple sweet dish. In a Vessel add a cup of Water and Sugar and prepare a thick Sugar Syrup on a slow flame and add Cardamom Powder. Clean the Pineapple and cut in thin round slices and remove the central hard piece. Heat the Oil in a Kadhai. 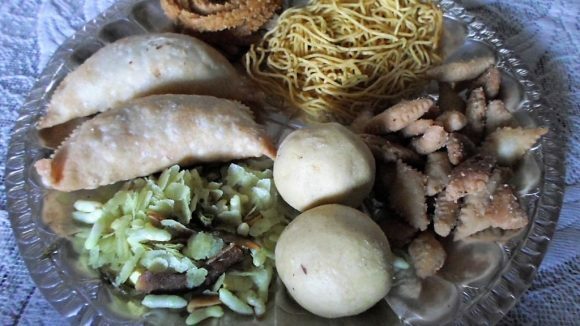 Mix the Rice Flour, Water and prepare a thick paste and dip the Pineapple slices in the paste and deep fry till color change in to light brown and then dip them in the Sugar Syrup for two-three minutes and then remove from Sugar Syrup and keep them in a plate.